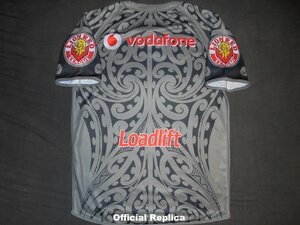 This jersey was inspired by the 2006 Awen Guttenbiel Testimonial jersey. 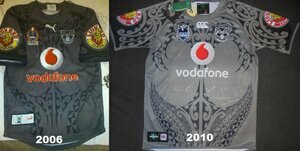 Still some key differences and it wasnt a faithful reproduction of Awens jersey. Worn at least twice by the Warriors in the NRLs traditional Heritage Round 10 against the North Queensland Cowboys and Round 8 against the Canberra Raiders. 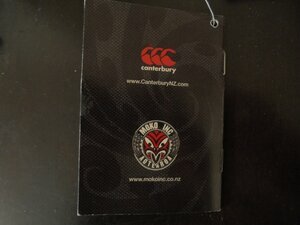 OFFICIAL REPLICA - The replica came with a booklet that explained the design of the jersey. Below is whats written in the booklet page by page. Theres also a picture of each page in the image gallery of this profile. Our aim is to utilise traditional patterns in a contemporary way while still retaining the essence of their ancient meanings and purposes. 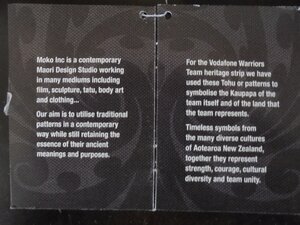 Page 2 - For the Vodafone Warriors Team heritage strip we have used these Tohu or patterns to symbolise the Kaupapa of the team itself and of the land that the team represents. 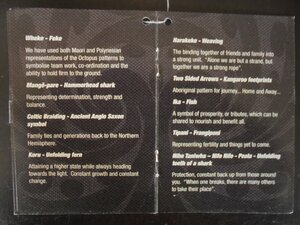 Timeless symbols from the many diverse cultures of Aotearoa New Zealand, together they represent strength, courage, cultural diversity and team untiy. We have used both Maori and Polynesian representations of the Octopus patterns to symbolise team work, co-ordination and the ability to hold firm to the ground. Representing determination, strength and balance. Family ties and generations back to the Northern Hemisphere. Attaining a higher state while always heading towards the light. Constant growth and constant change. The binding together of friends and family into a strong unit. "Alone we are but a strand, but together we are a strong rope". A symbol of prosperity, or tributes, which can be shared to nourish and benefit all. Representing fertility and things yet to come. Protection, constant back up from those around you. "When one breaks, there are many others to take their place". 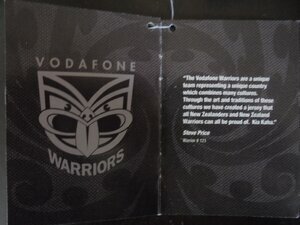 Page 6 - "The Vodafone Warriors are a unique team representing a unique country which combines many cultures. 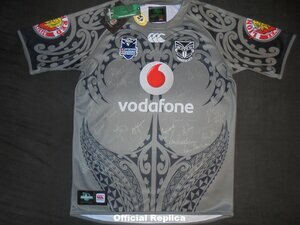 Through the art and traditions of these cultures we have created a jersey that all New Zealanders and New Zealand Warriors can all be proud of. Kia Kaha." 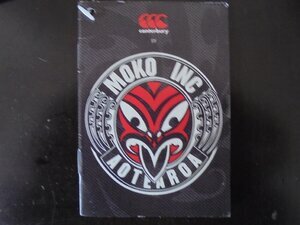 Back page - CCC and Moko Inc Aotearoa logos and websites. These jerseys sold in huge numbers but you'll be lucky to see any online. Especially in the larger sizes. Oneof the most popular designs the Warriors ever produced and mostfans have held onto them. Jerseys in XL or larger go for around $150 which is good for a second hand jersey. PLAYERS JERSEY - Same as the replica but with a slight taper and a white number.